On the afternoon of April 12, 2019 local time, Premier Li Keqiang met with Chairman of the Council of Ministers Denis Zvizdic of Bosnia and Herzegovina (BiH) in Dubrovnik. Li Keqiang expressed that China and BiH enjoy sound relations, complementary advantages, and huge potential for cooperation. China stands ready to work with BiH to enhance all-round cooperation, share development experience, explore new cooperation modes, and make good use of market rules, so as to make sure that cooperation projects between the two sides are sustainable. The two sides should enhance cooperation in transport infrastructure construction, and work together to promote cooperation between their respective enterprises, particularly that of small and medium-sized firms. The Chinese side welcomes more of BiH's agricultural exports that are suitable for the Chinese market. 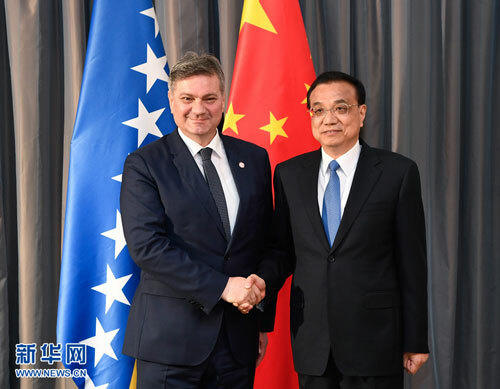 Denis Zvizdic said that BiH attaches great importance to its relations with China, and the two sides enjoy smooth bilateral cooperation in such areas as economy, culture and education. The 16+1 cooperation is an important platform which has great significance to regional economic and social development. BiH hopes to export more of its competitive agricultural products to China and enhance cooperation in areas including science and technology park, infrastructure construction, processing and manufacturing, so as to realize more mutual benefit and win-win results.